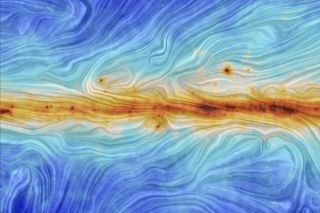 This visualization of interstellar dust interacting with the Milky Way's magnetic field comes from ESA's Planck satellite. Paul M. Sutter is an astrophysicist at The Ohio State University and the chief scientist at COSI science center. Sutter is also host of Ask a Spaceman and Space Radio, and leads AstroTours around the world. Sutter contributed this article to Space.com's Expert Voices: Op-Ed & Insights. Magnetic fields get short shrift. Nobody pays attention to them. Instead, everyone focuses on black holes, colliding galaxies, the Big Bang. The usual. Not poor little magnetic fields, threaded through and between the galaxies like spider silk, not pushing anything, not driving anything, not powering anything. They simply… are. They're serene and complacent. In reality, magnetic fields are the sturdy unsung workhorses of astrophysics. It's true that, most of the time, they just play follow-the-leader, tied to the plasmas from which they are born. But occasionally, they can bundle themselves up and become the dominant player in the physics game, unleashing their pent-up energies in spectacular displays such as coronal mass ejections and active galactic nuclei jets. Where there are plasmas, there are charged particles zipping around. And where there are charged particles zipping around, there are magnetic fields. So we see magnetic fields threading our own planet and sun, the solar system, distant nebulas and even the galaxy itself. We even see them extending millions of light-years beyond that, forming a tangled web between the galaxies. Wait a minute; hold on. How do you get big magnetic fields — and I mean, in case I'm not being clear enough, physically large ones — blown out to these tremendous scales? Galaxy clusters' magnetic fields are particularly intriguing. For one, they completely fill up the volume of their host cluster. For those keeping score, that's somewhere around 10^20 cubic light-years of nearly empty space. Despite their gargantuan size, those enormous magnetic fields are not perfectly smooth. They're tangled and bent on the scale of tens of thousands of light-years. That means that, if you had a sufficiently sensitive compass, you could follow a single magnetic-field line for about the width of a galaxy before it would branch off into a new direction. Even stranger is that these magnetic fields don't appear to be associated with any particular galaxies within the clusters. While we see that galaxies themselves host their own unique magnetic fields, they don't seem to be connected to the free-floating extragalactic ones. So, again, what's going on? For (literally) big problems in astronomy, there are two general courses of explanation. Course No. 1 is as follows. Perhaps the fields are cosmological in origin. Maybe during the hot and sweaty early days of the universe, in the first few minutes as exotic forces and fields vied for competition in the infant cosmos, some peculiar process (say, a phase transition when one force splintered off from another as the universe cooled down) could've flooded the universe with magnetism. That magnetism then would have just … hung around, gluing itself to all the matter as it condensed over billions of years to form the cosmic web — and the galaxy clusters — that we see today. That sounds great! Except we know what the early universe looked like. We have its baby picture, the cosmic microwave background. And we know how strong magnetic fields would've impacted the bumps and wiggles in that pattern. Plus, we know how magnetic fields would've further deformed that light on its 13.8-billion-year journey to our detectors. And both point to a young universe with weak, or even no, magnetic fields. So instead of settling for a cosmological explanation, astrophysicists tend to prefer a — wait for it — astrophysical explanation. In this scenario, there's no weird hocus-pocus flooding the baby universe with magnetic energy. Instead, magnetic fields start small and grow up along with everybody else. The first step is magnetizing an unmagnetized pocket of universe. This is surprisingly easy. If you have, say, a plasma that gets hit by a shock wave, the electrons can get separated from the ions, generating a current and thereby a magnetic field. Great! Too bad that "seed" field is incredibly weak — at least a trillion times weaker than what we observe. So what turns weak magnetic fields into strong ones? Dynamos! The phenomenon, which generates strong magnetic fields, occurs all over the place — in Earth's core, surrounding supermassive black holes. The fast, complicated rotation of a disk of plasma can whip magnetic fields up into a frenzy, converting gravitational or rotational energy into pure magnetism. Great! Too bad those dynamos are very small. They don't even typically operate across an entire galaxy. So we can easily get strong magnetic fields to form in the universe, but how do they get blown out of their host galaxies and stretched to fill such large spaces? The answer might lie in the dynamos themselves, particularly the ones around supermassive black holes. These monstrous engines power active galactic nuclei. We see the intense radiation jetting away from these objects, and we know those jets are highly magnetized. Is it enough to completely fill up the enormous volume of galaxy clusters? Honestly, we don't know, and we don't even know if this "bottom up" approach to magnetizing the cosmos is on the right track. It will take more data — especially from observations of the larger universe outside the clusters in structures called filaments, walls and voids — to get a clearer picture. But no matter how they got there, these gigantic magnetic fields are here to stay. Learn more by listening to the episode "Where do giant magnetic fields come from?" on the Ask A Spaceman podcast, available on iTunes and on the web at askaspaceman.com. Thanks to Chris N. and Pete E. for the questions that led to this piece! Ask your own question on Twitter using #AskASpaceman or by following Paul@PaulMattSutter and facebook.com/PaulMattSutter. Follow us @Spacedotcom, Facebook and Google+. Original article on Space.com.